"Jeb, Neil, Marvin, Doro, and I are saddened to announce that after 94 remarkable years, our dear Dad has died," his son George Bush Jr, who went on to serve as the 43rd US president, said in a statement. He has had difficult relations with the Bush family and did not attend Barbara Bush's funeral. But he is due to speak to George Bush Jr today. 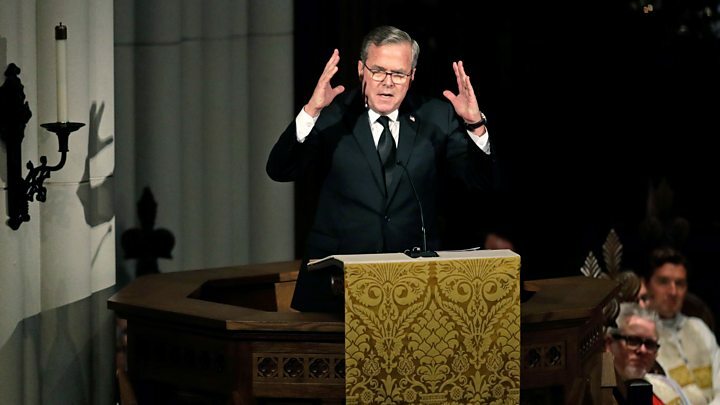 In one of dozens of tributes from former and current world leaders, Mr Trump praised Bush's "essential authenticity, disarming wit, and unwavering commitment to faith, family and country." 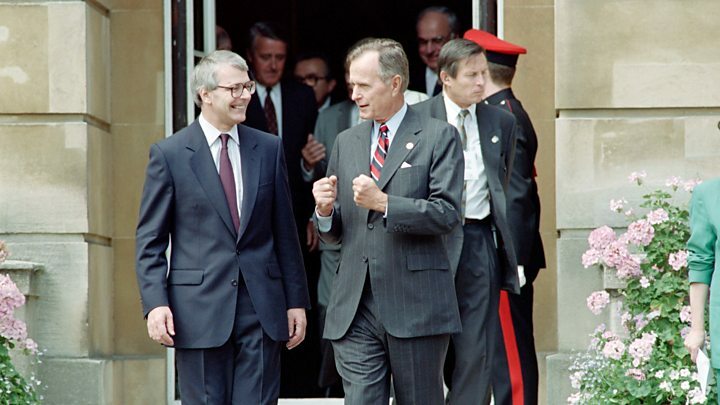 Bush Sr's single presidential term in office was dominated by foreign policy - the collapse of communism in Eastern Europe and Iraqi leader Saddam Hussein's invasion of Kuwait in 1990. He was instrumental in building the international military coalition that forced Iraq's Saddam Hussein out of Kuwait. Bush became president after serving two terms as vice-president to Ronald Reagan, but he suffered the ignominy of becoming a single-term president - defeated by Bill Clinton in the 1992 election amid a weakening economy. His famous 1988 campaign promise - "Read my lips. No new taxes" - came back to haunt him when he felt compelled to reverse policy. A statement issued by his spokesman after a recent incident said he would never "intentionally cause anyone distress". New York Times: "Some critics have said that Mr Hussein would not have been so bold as to invade Kuwait had Washington not shamelessly cultivated him over the years; others faulted Mr Bush for not pushing Mr Hussein all the way back to Baghdad and removing him from power. Such a course, Mr Bush said later, would have 'incurred incalculable human and political costs … We would have been forced to occupy Baghdad and, in effect, rule Iraq.' Which is exactly what his son, George W Bush, a less cautious man, set out to do 12 years later - with disastrous results." Fox News: "Although occasionally criticized for his lack of eloquence - such as referring to a focus on the larger picture as 'the vision thing' - Bush's comments also could be endearingly frank. Referring to his dislike for a particular vegetable, he once said, 'I do not like broccoli. And I haven't liked it since I was a little kid and my mother made me eat it. And I'm President of the United States and I'm not going to eat any more broccoli.'" Media captionEx-UK PM John Major: Bush Sr "raised America's standing in the world"
Bill Clinton said he and Hillary gave "thanks for his great long life of service, love and friendship", adding: "I am grateful for every minute I spent with him and will always hold our friendship as one of my life's greatest gifts"
Announcing Mr Trump's attendance, White House spokeswoman Sarah Huckerbee Sanders released a statement saying: "A state funeral is being arranged with all of the accompanying support and honours."